You peer warily out of the single window in your zombie-proof steel box. The street seems deserted—except for a lone figure who is staring at you from a distance. Is it 2079, in the years after the Great Drought Plague!? No, it's 2015 in Royal Oak, Michigan, and that zombie is a curious local Fox reporter. 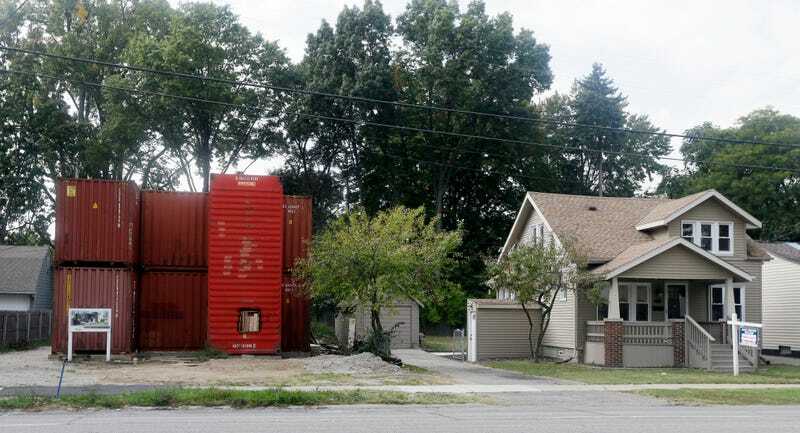 Royal Oak is just the latest American town to get a house made from shipping containers, which offer something unique to consumers with a taste for apocalyptic adventures. While designers are developing smarter ways to build temporary housing and disaster shelters, developers and real estate agents are using the same technology to sell trendy and high-end homes. What results is a bizarre kind of hybrid style that pairs our worst fears with our biggest hopes for the future—utopia and dystopia overlap. Call it disaster chic. New York City's emergency shelter prototype. Photo by Nick Stango. Shipping containers are far from the only mode of emergency shelter that's been co-opted for non-emergency use. Technological innovations developed for use during crises have been leaking into everyday life for years. Houses are smaller and more nimble, in some cases, even mobile. You can now pay for a 3D printed home—even a mansion. Companies open pop-up stores instead of expensive flagships. Even the aesthetics of emergency, in the corrugated metal siding of a new condo building or a shipping container wedged into an office, are chic. Why is disaster chic so alluring? Is it the constant threat of imminent chaos—climate chaos, statehood chaos, economic chaos—rearing its ugly head? Is it that people enjoy seeing themselves as survivors, in one way or another? Or is it that this tech is a kind of status symbol in some future Elysium-style world where only the wealthy have access to savior technology? It's hard to say, but it's worth looking at a look at some specific examples. For the past few years, everything slow has been good, from food to fashion. The idea of of slow architecture just hasn't caught on in the same way, and instead, city-building tech is only speeding up. Last month, a Chinese company called WinSun unveiled what appeared to be a cookie-cutter mansion at a housing expo in China. A closer look at the building revealed that its stone facade and the mansard roof weren't made out of stucco, but thin striations of something else— specifically, a proprietary mixture of construction waste and cement which had been squeezed through the nozzle of a enormous 3D printer. The entire thing had been 3D printed. And then painstakingly styled after an aristocrat's manse in 18th century France. WinSun's 3D-printed mansion, courtesy of 3Ders.org. WinSun says it will change how emergency shelters are made, and it says it's already moving to use the technology this way. The company reports that its tech has already been purchased by the Egyptian government to create 20,000 homes to ease the country's housing shortage, though inquiries to WinSun about the mansion project weren't answered. Another player in this industry, Contour Crafting, was founded by an engineer from a particularly earthquake-prone region of Iran to improve housing in crisis zones. "Victims of emergency situations such as war and natural disaster should not have to wait months to regain a suitable quality of life," the company writes. 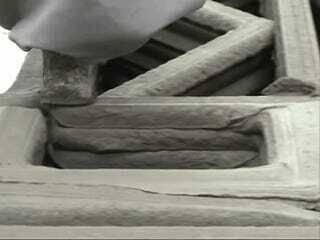 Wasp, an Italian 3D printing company, has plans to build affordable houses out of mud "ink." But the dream of an instant, well-appointed home is also clearly part of the allure. While the WinSun's printed mansion is inexpensive compared to building a new home conventionally, it's not cheap: It will cost around $161,000, and WinSun says 10 have already been ordered. Meanwhile, in New York, an architect named Adam Kushner is building an entire "estate" using a 3D printer. Motherboard's DJ Pangburn writes that Kushner plans to start with the hot tub, but expand to print a house, cabana, car port, and more. "Kushner hopes his effort helps trigger a paradigm shift in the way things, from buildings to underwater structures, are built," says Pangburn. Yes, structural printing could clearly transform the way emergency shelters are made. But we're seeing it appear in the homes of the wealthy, too. Around the same time WinSun unveiled its rapid-prototyped mansion, a Dutch construction company called Heijmans was showing off a project designed for, in its words, "The well-educated: between 25 and 35 years old, first job, single, the world at their feet." What help does this privileged demographic need? Heijmans explains that since housing in cities is so expensive and poor quality, it designed a prefabricated house called ONE—a reference to the single status of its intended user. The home is transported via truck to underused spaces in cities and assembled in 24 hours or less, then rented out to young people for around $860 a month, according to Inhabitat. "In 2050 we will count no less than 700,000 of these 'young and high potentials,'" the company explains. ONE uses decades of research about prefab housing to benefit a generation of people who want to live in cities but can't really afford it. Top: Heijmans ONE. Bottom: New York microhousing. Prefab housing goes back for more than a century—it's been used in housing crises, war-time shelters, and a plethora of over problems, including New York City's own housing shortage. It's also increasingly being uses as a solution to the problem of skyrocketing real estate prices in the world's most expensive cities. In NYC, former Mayor Bloomberg initiated a project called adAPT NYC that asked architects to design "micro-apartments" for young professionals in the city. The winner of the competition, Monadnock, is building 55 of these tiny units, which start at 270 square feet, to show off the technology. The prefab units will be assembled in the Brooklyn Navy Yard and driven to Manhattan, where they will be installed in the East Village. In a way, they are emergency shelter—if you consider outrageous real estate prices an emergency. There's no more constant feature of the instant city than the shipping container, so it's surprisingly difficult to find out when shipping containers were first used as ad hoc shelter—it seems like it's been going on virtually since they were invented in the 1950s. But because containers are often used to ship supplies and weapons to war zones—the US government had more than 92,000 containers in Afghanistan in 2013—leftover containers have been used as protection or storage as least since the Gulf War. Architects have been fascinated by containers for even longer—a phenomenon that's been brilliantly christened "container urbanism" by Mitchell Schwarzer. In the urban chaos of post-World War II cities in Japan and the UK, technocractic architects imagined rebuilding their cities as ever-changing grids, where a home was a brick that could be moved around as the user wished. In the face of economic and urban chaos, the idea of house that could be packed up in minutes and shipped to a new location was incredibly attractive. Today they're used as temporary worker housing, as well as housing for refugees and displaced peoples in crisis regions. In Japan, they were used to create temporary housing after the 2011 earthquake and tsunami. Top: Shigeru Ban's temporary housing for earthquake and tsunami survivors. Bottom: United Nations Relief and Works Agency (UNRWA) containers, in Nusseirat refugee camp, central Gaza Strip in 2010. AP Photo/Khalil Hamra. The thing is, shipping containers aren't usually a great solution for permanent architecture. They are only strong enough to support weight at their corners. They are fairly difficult to alter and have no insulation, windows, or doors. Sometimes they are contaminated with toxins or lead. They simply don't seem to make great living spaces, as people who have tried to do it will tell you. Yet they are seemingly everywhere: Dwell will tell you how to buy one. Google uses them as meeting-pods in its whimsical offices. They are often used to stage "pop-up" stories by brands like Puma, Freitag, and the apparel-maker Aether. There are hundreds of high-end homes built using containers. Puma's "container city" store and office space, designed by LOT-EK Architects. Bottom: Container cabin via Gubgib. Shipping containers seem to hit a trifecta for many homeowners: Re-use, security, and trendiness. It's almost like the language of the global shipping economy is fashionable, and with it, the idea that your home could be packed up and go with you to sea. If you ever should need it to. Of course, it's not surprising to see interesting ideas cross-pollinate—3D printing, containerization, and pop-up dwellings are all really cool concepts, and there's no reason they should be shrouded in break-in-case-of-emergency glass. What's interesting is how similar our ideas about crisis engineering and future chic really are. In the city of the future, everything is instant, whether for a good reason or a bad one. The cities of our dreams have a lot in common with those of our nightmares. Update: It's Royal Oak, not Royal Oaks! Lead image: A home built of commercial shipping containers in Royal Oak, Michigan. AP Photo/Carlos Osorio.